Jonathan and Drew Scott, better known as The Property Brothers, have a penchant for creating dramatic transformations with simple color palettes that walk the line between trendy and timeless. 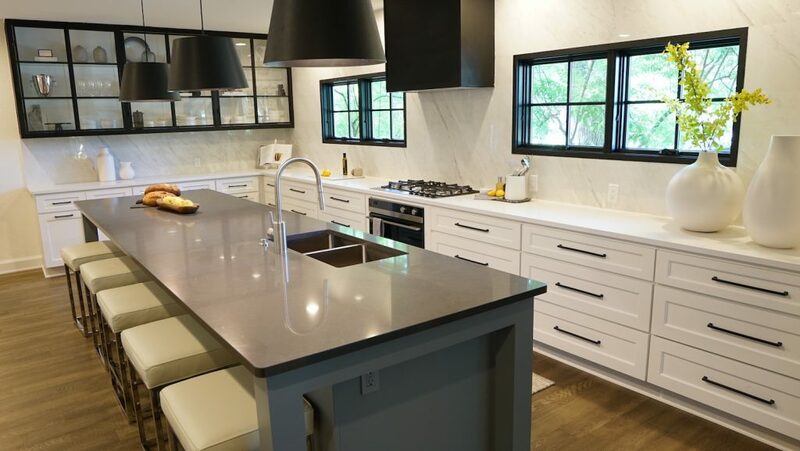 In a few of their most recent renovations, from modern farmhouse to transitional style, black and white in equal measure prove to be the perfect partners to create crisp lines and bold accents. When durability is a must and projects move quickly, the brothers have turned to Integrity Wood-Ultrex windows and doors for a bold aesthetic, lasting durability and a reliable delivery timeline. For several of their most recent projects, Drew and Jonathon were among the first to gain access to the new black painted interior finish and sleek matte black hardware, now available on all Integrity Wood-Ultrex windows, swinging doors and the sliding French patio door. With a factory finish, projects can move to completion quicker by eliminating the need to paint on-site. Window and door parts are finished with a prime and paint system before they’re assembled, ensuring complete coverage and a finished seal. Our labor and time-saving factory painted black interior finish is now available across all of our product lines including Marvin aluminum clad and wood products as well. As bold black with matte hardware and accents continue to trend from appliances to technology to automotive, we take a look at some of Drew and Jonathon’s recent interpretations of this lasting trend. This bold transformation proves that you don’t need a colorful palette to achieve a striking look. The addition of some much needed contrast to a previously all-white kitchen creates instant dimension. This kitchen uses fresh white and pops of black in the Wood-Ultrex windows, pendant lighting and cabinet hardware. Other than a few organic accents in the form of a fiddle leaf fig plant or the beginnings of a healthy dinner, the palette is intentionally muted to let the black accents make their mark. Although we’re the first to say we love natural wood in a space (our Wood-Ultrex line is now also available with a clear coat finish that lets the beauty of the wood shine through), the “before” on this farmhouse was a little overwhelming and doesn’t pay off the energizing effects of sunlight in the space. With a fresh coat of white paint, the log walls become a calming backdrop for a unique twist on a black window – a mixed finish with white trim and a black sash and frame for a sleek, modern effect. For an entryway that was once closed off and drab, bringing in more light and a view to the outdoors through a dark frame was just the answer. An Integrity Wood-Ultrex Swinging French Door with our factory-applied dark finish opens this space up, and pairs perfectly with the contrast of the black and white tiled floor. The custom grille pattern that tops the door adds visual interest while allowing maximum light flow that can make a small space appear bigger. The light and views in this home might not have needed any transforming, but by replacing a more traditional stained wood look with sleek black interior finish and reconfiguring the window grilles to add style and interest with a clear view, the look was elevated to match the Property Brothers’ vision for a more contemporary home. Heavy wood blinds are swapped for bright white curtains, warmer beige walls are painted a crisp white and matte black curtain rods are used to reinforce black as a design element in the space. As the ultimate basics, black and white might not be new additions to a designer’s color palette, but the rising popularity of dark interior window finishes and rooms like these that make black and white their defining features show that top designers and remodelers can agree in the power of clean lines and bold contrast.